What is Self-control? Self-control is about regulation of emotions. Self-control is about regulation of emotions. There are lots of research about “self-regulation” which happens in the frontal lobe which does not fully develop until the age of 21. However, children can be taught self-regulation directly even if their own brain has not reached the developmental stage to do it on its own. A child must trust and have confidence in the adult who is doing the training or teaching. Without feeling trust toward the adult, a child will give the instruction little importance. In 1976 Walter Mischel published his book The Marshmallow Test. He went around the world and performed this experiment to learn more about self-control in his quest to quit smoking. He placed a marshmallow in front of various children and told them they could have it or wait for the bell and they could have that marshmallow and another one, which he sat to the side. The children saw that they could trust that if they waited there would actually be a second marshmallow to get. 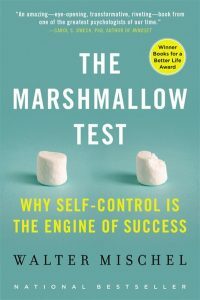 Mischel learned that children who were able to consider the situation, and who wanted marshmallows, could control their impulse to eat the one marshmallow knowing they could receive two. This experiment shows that a child must trust the other marshmallow is not just a ruse to make them wait. Here are three rules to help parents teach their children self control or self regulation. Rule #1: Be trustworthy if you intend to teach a child self-control over his emotions. It is also helpful if a child can see this behavior in the adults in his life. In other words, do you model the ability to wait for what you really want or does the child observe you unable to put off self-gratification to gain more success? The child has to see and understand why you wait to do something. They need to be shown and told that you are wanting something more. Once this is understood by the child, then you must “set up” practice sessions by focusing on the behavior you want to change first. In the case of a child who talks too much and creates an issue during class time at school, he has to see what can be gained by waiting to talk to his friends during recess or after school. Rule #2: Practice the behavior. To learn something well, it takes practice. When your child has behavior you want to change, like talking all the time, you have to stop and practice with the child and explain exactly what the expectation is. Your child will need to practice self-regulation or self-control over impulsively talking or saying what comes to his mind when it comes to his mind. He has to learn to wait. One way to do this is to tell your child that his teacher will send a note home each day telling you how many times she had to ask you to stop talking. Each time he lessens the amount of time the teacher asks him to stop talking from the your child can earn time to talk to his friends after school on the phone, or he can have a friend over for one hour to play after school or on the weekend. In other words, you are saying to your child, “It is great to have friends and it is great to want to talk with them, but not when you are supposed to be working.” Then make sure you do what is promised, in fact, go ahead and call a friend and set up the play day with his parents to prove to your child you believe he can do this. You can practice by having your child remain silent during a 30 minute quiet reading time beside you on the couch. If he remains silent for the 30 minutes, let him call and chat with a friend for a period of time. Rule #3: Don’t criticize, belittle, or punish your child because of lack of self-control. It does not work. Instead show him how and help him learn with your support and guidance. Because you are putting your child in a situation where he is learning self-control, there is no punishment and no reward, just learning how to control when he talks. Make sure you are there to assure him that even if he doesn’t find success on one day does not mean that he won’t the next. Demonstrate love and respect to your child when setting the expectations. Life is full of need for a person to be able to control his urges appropriately. When you parent by teaching, guiding, and explaining the expectation, practicing it, modeling it, so your child knows what it looks like, then and only then will your child be able to grow into the best adult he can be. What are some behavioral issues you are dealing with?